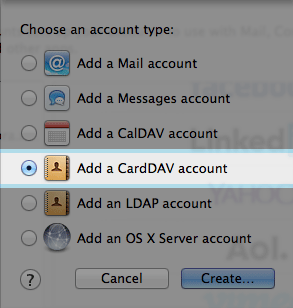 If you have a Zimbra Business Premium or a Personal Premium account, these instructions will show you how to sync your Zimbra "Contacts" folder with Apple desktop applications using CardDAV. 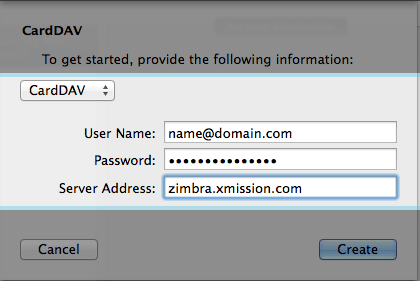 Apple will only sync your primary "Contacts" folder from Zimbra via CardDAV. 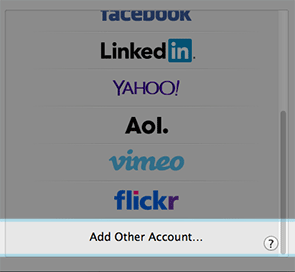 So if you have shared Contacts folders to see them on your Mac desktop it will require the addition of the EWS licensing above or use of Zimbra webmail. There is an available option to utilize ActiveSync (what Apple calls "Exchange" in their configuration options) which requires use of EWS licensing. This is available for an small additional fee per month from XMission. This licensing also allows native Outlook for Mac functionality. Contact an XMission to add this feature. Once you click on Create your contact will now start to sync.